Hi Stampers and Welcome to the Sparkle N Sprinkle Autumn Inspirations Blog Hop!! If you came here by way of Linda's Blog you are in the right place....if you didn't you might want to hop back to the beginning at Sparkle N Sprinkle and follow the hop along. Make sure to leave comments along the way so you have a chance to win the many prizes! For my card I chose the Pumpkins stamp, I started by using the new Pazzle Inspriations Electronic Cutter (watch the Sparkle N Sprinkle website for more details) and I created the cut file for the stamp image itself! (this cut file is now available here!!) Then I used a Stamp a ma Jig to stamp the image in the cut out. Then I had fun Zentangling the image, then I had some more fun coloring with my Copics and to finish it off I had to add some glitter with the Glue Pen....I am so happy with the way it came out. I embossed the sentiment with Black Detail embossing powder. You can find all the details to my card here. Thanks for stopping by and leaving a comment.....when you ready to can hop on over to Julie's Blog for more Autumn Inspiration! Love your Zentangling, Jill - makes those pumpkins extra specially cute! I have never Zentangled before, but this makes me want to try! Just so cute :) Love the glitter you added too! 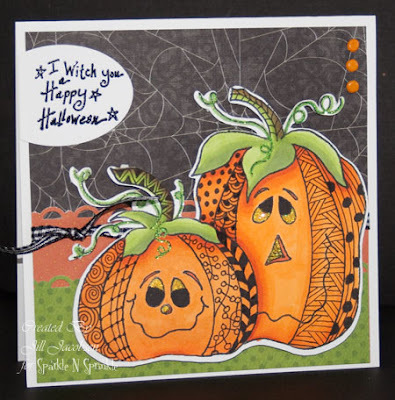 Your Zentangle is really nice on the pumpkins, I love to tangle and will have to do that with some of my stamps. Yep - sensational zentangling! Really adds happiness to your card Jill - love it! I like the way the web fills the background...nice job! Love all of that Zentangling! You really do a great job! Love the pumpkins. Jill your Zentangling is awesome. I love the veinie look it gives the Jack O Lanterns. I love your pumpkins and I can't wait to learn this technique. Nice. Nothing says Halloween better than happy pumpkins. i really like the texture that the different designs give the pumpkins. I really like the way you did you did your pumpkins! i haven't tried Zentangling yet. After I've said "WOW!! ", what else is there? Fantastic, Jill. Wow! Zentangling adds such character to these cute pumpkins. Barb P.
Love the zentangle!! I just read an article about it and it's nice to see it used another way! I love the pumpkins. Great cards. Zentangley neat pumpkins. Thanks for showing this technique. Jill, that pumpkin card is a pure delight. Love those funny faces. Your card is really cute! I love how you zentangled the pumpkins. Great job! Now these are pumpkins with pure class! I've never done Zentangling, but after seeing your wonderful work, I am definitely going to give it a go. Thank you! This card is great. I love the use of zentangle in the pumpkins. Very cute idea. Just recently stumbled upon Zentangle and I love how you used it on your pumpkins. Great Card!!! I love the Zentangle. It looks like it should be a part of the stamp. I always forget to use my Stamp-Ama-Jig. I will have to pull it out. Your pumpkins are cute. Children would get a kick out of them. Thanks for sharing with us. Love the texture on your pumpkins and the way the pumpkins contrast with the background. Cute card! thank you for sharing and giving us the chance to win! Hi Jill, I love this card and the Zentangling makes it even more special. Love what you did with the Pazzles Cutter. You Go Girl! I love the way the pumpkins came out. I never heard of zentangling before this blog hop. I love the textured spider web! very spooky! Those pumpkins are so cute! Almost hard to believe they started out as a stamp! Super cute, great job on your pumpkins. I have to come clean, I'm not a big Zentangling fan, but....I love how it looks on this card. Fun, cute, interesting - really cute card Jill! And you got to cut it out with the Pazzle - now I'm extra jealous!! I love what you did with these pumpkins. Awesome card. Your zentangled pumpkins are too cute for words!